Teri Johnston was overwhelmingly elected mayor of Key West Tuesday. After finishing with 48 percent of the votes in a seven-person field in the primary, she beat another former commissioner, Margaret Romero, 66 to 34 percent in a runoff Tuesday. "Key West is such an inclusive community. We should be a shining example for the world," Johnston said. Key West has been a leader on that front before. In 1983, Richard Heyman became one of the first openly gay mayors in the country. Another mayor came out after she was already in office, said Stratton Pollitzer, chair of Equality Florida Action PAC. Johnston is focused on issues from affordable housing to sea level rise. But she said she was glad to be out front in a time when the national government is pushing back on LGBTQ recognition and rights. "That's one of the things that draws most people to Key West. It's a difference in philosophy and it's a difference in how you live your life," she said. "And we live our life based on the fact that people are good people. Nothing else." Other local races in the Keys included two for Monroe County Commission. Incumbent Commissioner David Rice, a Republican, defeated Vicki Tashjian, who had no party affiliation. And Marathon Mayor Michelle Coldiron, a Republican, won her first countywide seat, defeating Democrat Tommy Ryan. Coldiron took the seat that George Neugent has held for the last 20 years. Neugent, meanwhile, appeared to just miss out on taking a seat on the Marathon City Council, where four candidates were vying for two positions. Luis Gonzalez took the most votes, while Mark Senmartin edged out Neugent by 49 votes. Robert Barrios beat Beth Ramsay-Vickery to became the first person from outside the city of Key West to serve on the Utility Board, the elected body that oversees Keys Energy Services. That's the utility that provides power from the Seven Mile Bridge to Key West. And Mosquito Control Board chairman Phil Goodman beat a challenge from former district employee Ralph DePalma to retain his seat. Voters in Islamorada decided against extending the terms on the Village Council from two years to four. Johnston campigned Tuesday across the street from the City Hall where she will soon preside. The city flies the rainbow flag out front, along with flags for the country, the state and the Conch Republic. Jennifer Castillo, left, and Stacy Ryan campaigned on Tuesday as 'moms for Teri.' They're also her daughters. People held signs in support of Johnston across the island. 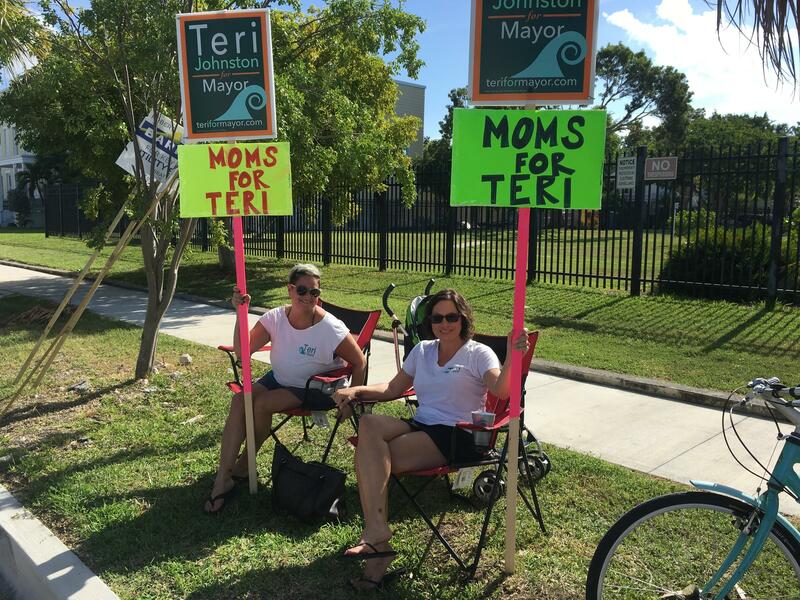 Johnston's daughters held signs that read: "moms for Teri." Neither of them could vote for their mom in this election. Stacy Ryan lives on Sugarloaf Key and Jennifer Castillo lives in Elmhurst, IL. But they said they wanted to help campaign and support her. And they said they were proud of her status as Florida's first open lesbian woman to be elected mayor. "We love our moms and they have raised us to love everyone and look at everything with an open mind," Ryan said. Monroe County set a record for early voting this year, with more than 40 percent of the county's 47,051 registered voters voting early or by mail before Election Day. Total turnout, including voting on Election Day, was 77 percent. That compares to 57 percent in the last midterm election in 2014 and 79 percent in the presidential election in 2016.